I had a play with the projector today. Not really sure I feel about these works yet, they’re still far too fresh for me to form an opinion of them. There are elements I’m really happy with though, primarily the physicality created by the projection. It really has been a struggle for me working so digitally and having everything on a screen, but even though these are images projected from a laptop, they reclaim the physical. They also take away the perfection of an on-screen image as the distortion was a key concept to them and something I generally find very appealing. I also really like the way in which the projector has saturated the colour, it’s created a kind of pastel rainbow which I think brings a real sensitivity to the images. Completely unintentional but I am in no way complaining! It is often the accidents that create the best works! I think they’re quite playful works. But then that may be because I know the root of their content. 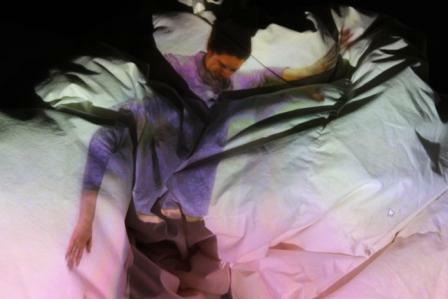 These images are stills taken from a film of a performance I did. Wow that’s quite a sentence there isn’t it? How many mediums have I crossed to create these?! I guess in a way these works are the combination of all my other works layered together. It’s a build up to an endpoint almost like the layering of paint on a canvas. The painterly mindset really hasn’t left me despite technology being the current basis of my work. I’ve decided film is really not for me though. I’ve tried and I’ve pushed it. But as my films are merely experiments, almost like a digital sketchbook, they don’t work beyond the moment in which I created them. When I watch them I instead think in stills, which is why I am able to draw out the moments that convey what I am trying to depict so easily. For me it’s still very important to maintain a sense of ambiguity in my work which is why I’m not really explaining anything here. I don’t want to and I don’t need to. I don’t want everything about my art laid out on a plate. An image should be able to stand for itself. And I think these experiments are a perfect demonstration of that. Only I know what exactly went on and how I got to this point, but the viewer is free to interpret it as they will.